If you’ve been reading my blog for a while you’ve probably noticed that I haven’t posted nearly as many building projects since we moved to DC last May (has it almost been a year already??) There’s a good reason for this-we just don’t have the space we had at our last house for the actual building process or space inside to keep any new furniture….urban life is definitely more cramped than it was in the ‘burbs! 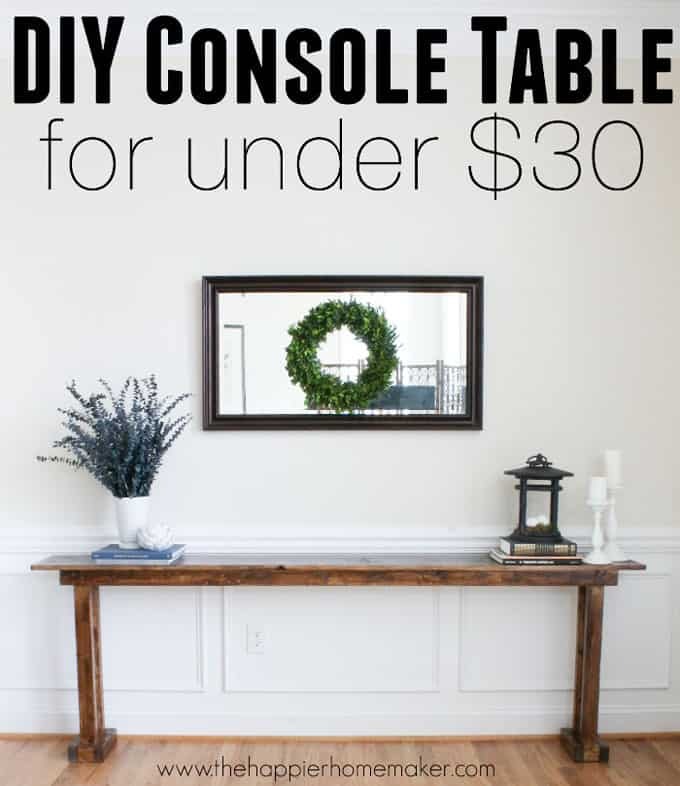 That being said, my husband had been tossing around the idea of building a console table for our living room after I may have complained a few (hundred) times about not having enough “surfaces” in the house to decorate and place pretty vignettes! 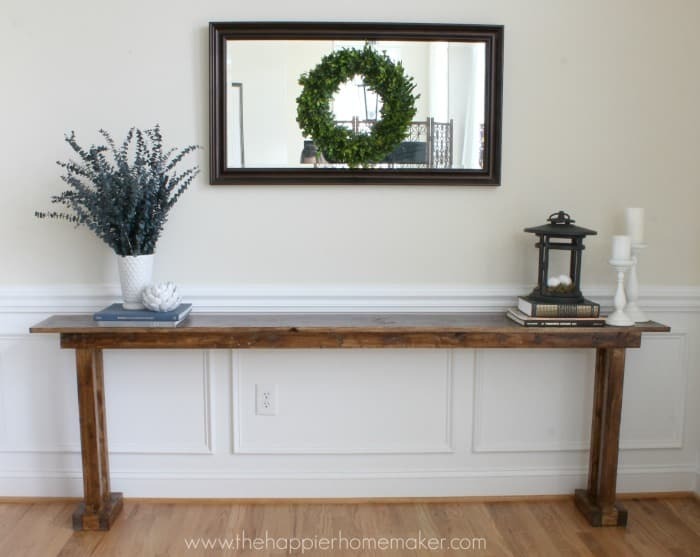 He finally decided to take advantage of our last big snowstorm of the winter a few weeks ago to knock out building our DIY console table! (Did you notice he grabbed my pink safety glasses? I didn’t until I was editing the pictures!) Excuse the dryness of the tutorial-I was peeking in every few minutes to take a picture-it was so cold in the garage!! 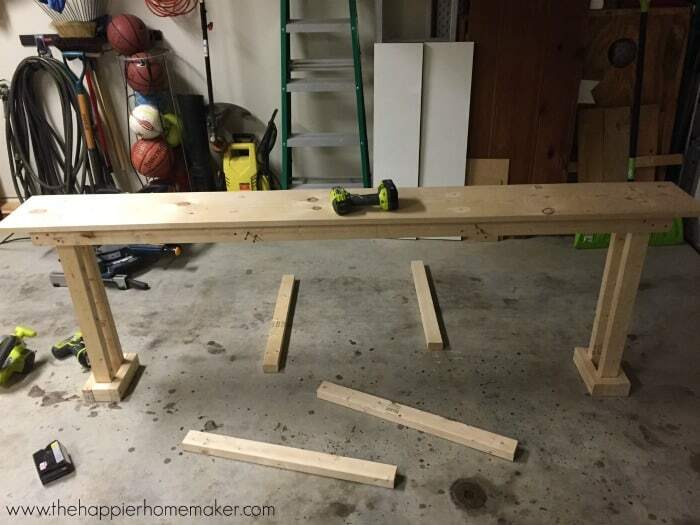 The first thing he did was create a frame for the tabletop using the two 7′ boards and 4 six inch boards. He pre-drilled all holes prior to securing with the screws. 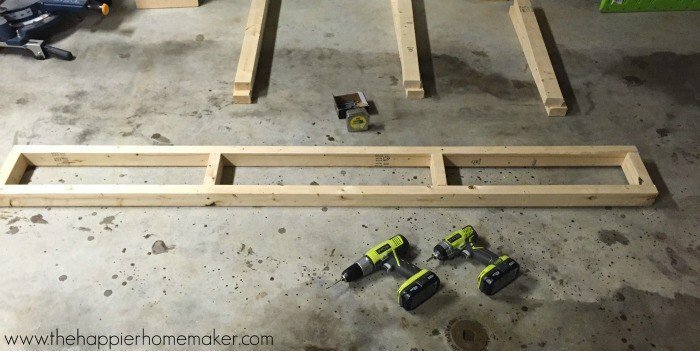 Once that that framed out he added the 1×12 for the top, using 2 screws in each of the six inch framing boards to secure it. He then filled the wood holes with putty. Next the entire table was turned upside down so he could attach the legs. On each end of the table two of the 30″ boards were attached to the inside of the frame, then a third 30″ board was wedged between them to create a very shallow “U” type of shape. This wasn’t part of our original plan (what we had of a plan as this was more of a plan as you go build!) but it looked much better with the third board between the legs due to how narrow it was. Next the entire bottom was boxed in to create a base using the 9 and 3 inch boards. 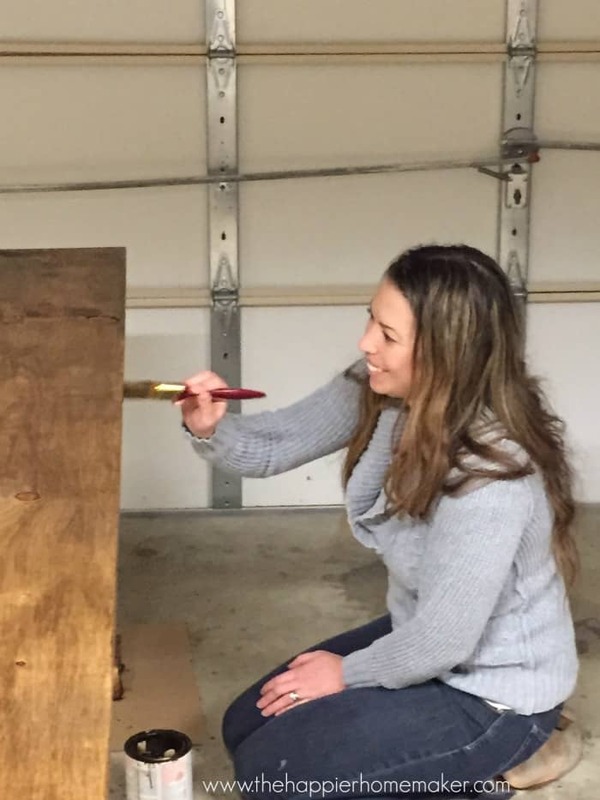 At this point my husband switched out with me so I could finish the table and he could have a go at the three crazy kids bouncing off the walls wanting to get out in the snowstorm! 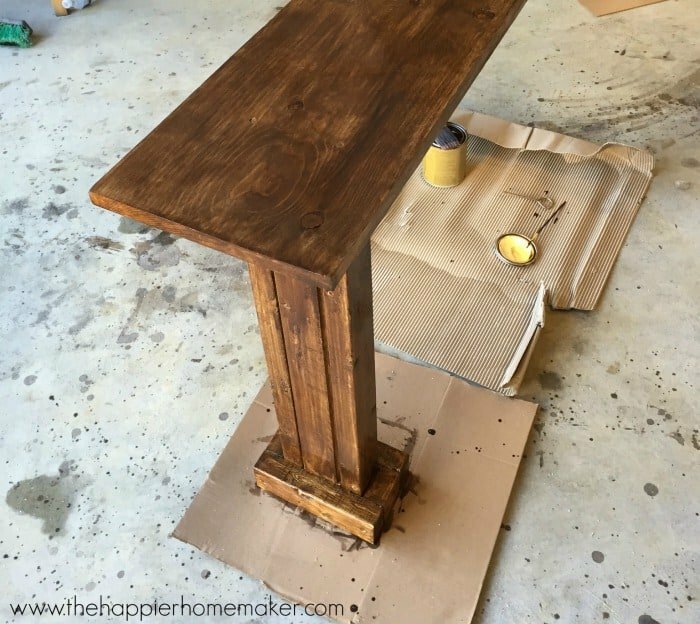 I sanded all the edges of the table as well as the areas where he had filled screw holes with putty. At this point I realized I was all out of wood conditioner which was very inconvenient because I ALWAYS condition wood before I stain it and there was no way to get out in the storm to get more. I decided to try and stain without the conditioner but don’t recommend it…I ended up having to do more coats to fix blotchiness. I can’t even tell you how cold I was out in the garage staining! 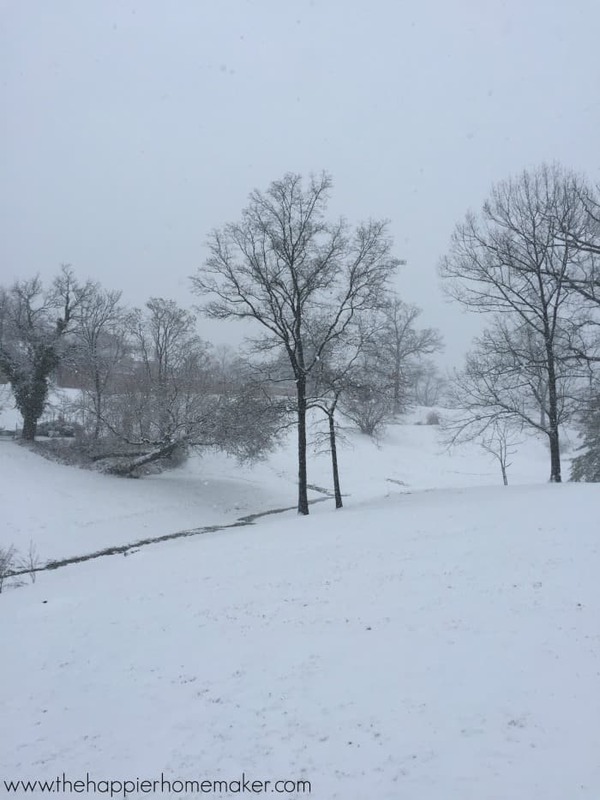 My husband thought this was hilarious as he poked his head to check on my progress and snap this pic…he likes to make fun of my Southern disdain for any temperatures under 60 degrees. I used one coat of Kona stain followed by a coat of Mission Oak Polyshades to try and correct the irregular staining I mentioned before. The Polyshades has polyurethane already in the mix so I didn’t have to do that additional step. I really love the way it turned out, and it was a fairly quick project! It’s actually between the wall and our couch right now but I moved the couch to so you could see it. I’m hoping at our next house it will be able to be behind the sofa but visible because I think the details are worth seeing! 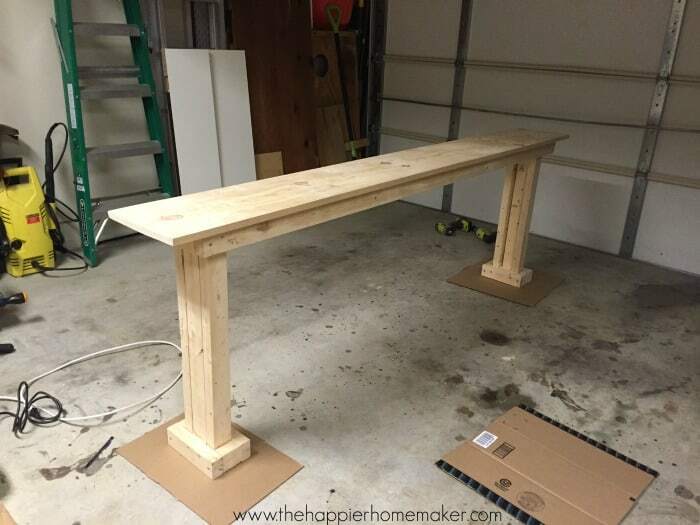 We also made ours to fit the exact length of our sofa and the plans could be easily altered to fit any area you wanted, although I wouldn’t recommend going much longer than ours unless you are going to brace the bottom or add more stability to it. Is anyone else ready to get to work on some DIY builds now that the weather is warming up? I have a huge pile of things waiting to be spray painted that I’m tacking this weekend! Love the table!! As soon as I can get a saw I want to make something like this. I guess I could always have the guys at Home Depot cut it for me! My husband and brother-in-law are each incredible carpenters. 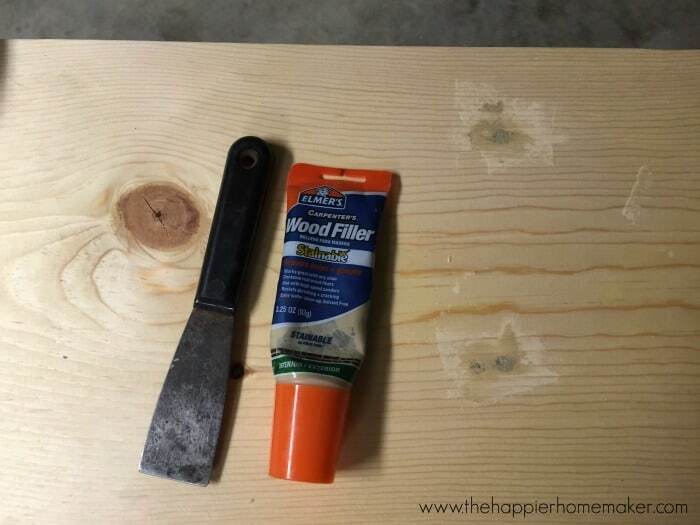 If you’re not going to stain the wood use any vegetable oil to keep it in good shape. Great tip Jenni, thank you! That is a gorgeous table! Well done, both of you! Love this! I just need it to be about 5 feet long. I need to figure out how to shorten it. How tall is it? I’d love any advice you have! Love the table! 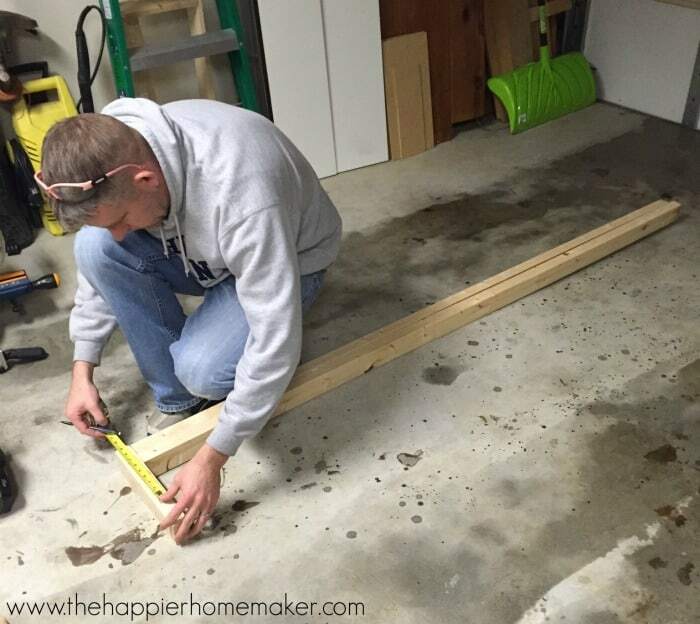 What length of wood deck screws did you use? Thanks Mycah, they were 3″ wood screws. Good job! Question about how sturdy is it? Mine would be behind couch in a walk way. Does it seem “tippy”? Do you have a picture with the size of wood parts labeled? I’m so clueless so I need MAJOR help- I’d like to have this be a 5 ft sturdy standalone table. How do I tweak the measurements to reflect that? 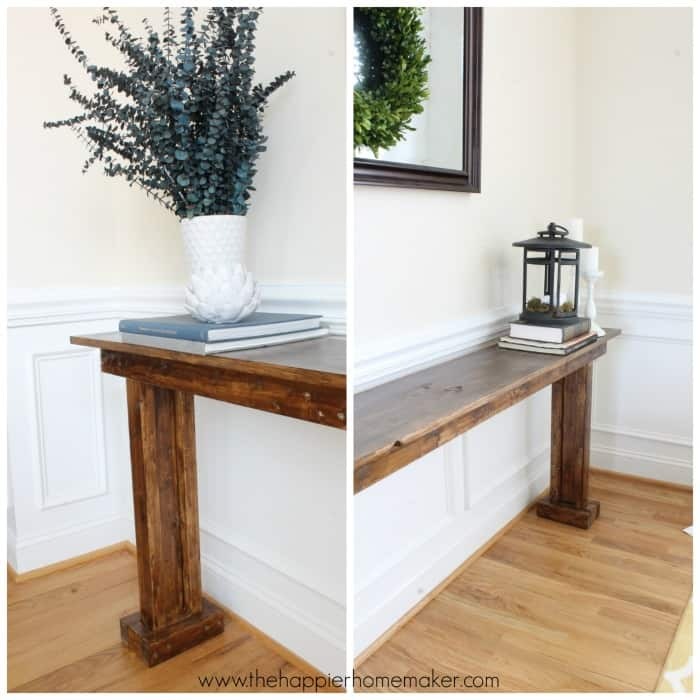 Great console table, the way you listed out the cutes for 2 x 3 boards. Should we cut it in that order to save some waste or does it doesn’t matter the order. What is the length and width of the table? Where did you find 2×3 boards? The only ones I can find in my area 3ft long. The 2 by 3 boards are 2 inches thick and 3 inches wide, for this project I bought 6 eight foot long boards of that measurement. I found mine at either Home Depot or Lowes, I don’t remember which but all should have it. Just ask an associate!